Plantar-fasciitis is a seriously annoying, long lasting painful condition of the big ligament that passes along the sole of your foot – It will persist unless the daily cycle of night time healing and repeated damage through daily walking is interrupted. Classically this is caused by tightness/rigidity of the Achilles/plantar-fascia complex and is massively exacerbated by rolling or flat foot posture. This condition rarely occurs in athletic individuals with loose, supple or well toned legs. The plantar-fascia connects the bottom of your heel bone to the front of your foot (Below), your Achilles tendon attaches directly into the opposite surface of your heel bone and directly affects the state of the plantar-fascia- hence why I’ll keep going on about Achilles and calf tightness. Untreated this condition will rarely resolve itself within 9 months – Sometimes lasting for years. Wear insoles – always – as it aids the control of the movement of your feet through the day, protecting your feet from the excessive twisting and stretching movement on the insertion of the plantar-fascia at the heel bone. An incorporated slight heel raise also benefits by further reducing the tension of your calves. Stretch your legs, especially your calves and hamstrings every morning before walking and regularly through the day (to try to get some extra length in your calves and Achilles) – While we sleep our muscles and ligaments shorten and the foot is pulled into a relaxed posture with the toes pointing down – this period of rest allows the body to try to heal the affected area and it does this by laying down scar tissue that, is put under too much tension when we force our feet into a 90 degree position as we haul ourselves out of bed in the morning thus causing the newly formed scar tissue to tear/rip away causing extreme pain. This pain lasts for only the first few steps and soon subsides as we continue to walk. Passive stretching prepares our muscles and the fascia for the onslaught ahead. Contact your P.T. for advice about dynamic stretching to maximise the effect of your stretches. See Grange Physio’s exercises for walk through stretching guides. Book yourself in for a deep tissue sports massage twice a week initially to help reduce the stiffness and rigidity in your legs and feet. Tightness in muscles and the resulting reductions in ranges of movement in your joints transfers huge tension to the plantar-fascia compounding the problem. A good massage will hurt and find muscles you thought you never had. We look after our cars better than we look after our bodies – keep up a regular monthly massage to keep supple. Don’t forget to drink lots of water after your massage. High frequency vibrations focused on the affected area helps by gently breaking down the scar tissue that untreated can delay healing. Contact you Physiotherapist for advice on this treatment. Avoid very flat low heeled shoes and traditional flip-flops as the low heel forces the achilles and plantar-fascia to be put under increased tension. Avoid walking barefoot – always wear supportive slippers around the house. Wear day shoes with a slightly more than average heel height to reduce the tension in your achilles. Try fit – flops (girls) or MBT shoes for improved cushioning at heel and smooth roll over the toes. Look for soles with cushioned heels as hard soles create jarring and heel pain. Fit-flops or MBT shoes or clark’s ‘wave’ shoes all incorporate fore-foot rockers easing the load on your foot during gait. There are a variety of devices that you can wear to keep your feet in a stretched position through the night. Unfortunately they generally look and feel like snowboarding boots and their bulk and rigidity are rarely appreciated by sleeping partners. (below left) These retain cheaply £30-50 but are pretty nasty to wear and impossible to walk with if you get up to go to the loo in the night. 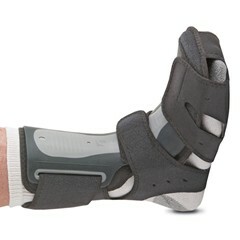 Footworks clinic stock a vastly superior front fitting night splint (above right) which gives significant improvements to comfort. 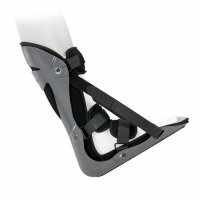 A well padded contoured aluminum shell works perfectly to maintain your foot in a stretched toes up position keeping tension on the plantar-fascia forcing it to heal with your foot in a functional position either when seated or whilst sleeping through the night. Contact me directly if you think that this may benefit you. Don’t bother exercising unless you have warmed up and stretched really well before hand. Swimming is Ok as you swim with your toes pointing down, but take care stepping out of the pool – take time to sit on the side and do a few passive stretches before walking. Remember to stretch after exercise. If you can afford to lie on your back and let the kids do all your work then your feet will heal beautifully in about 8 weeks and you will forget how horrendously painful this awful condition is! 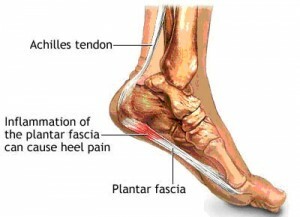 5 Responses to Plantar-fasciitis (Heel Pain) What can you do? I have had cortisone injections, and wear insoles but still suffer with pain on a daily basis. I do achillies streches but not religiously. Are there any good sites out there that sell fasionable sandals/shoes. I’m wearing foot logics insoles for the past week, starting my day with exercises and trying to minimise long episodes of walking. I’m even doing stretches in bed before hobbling around (in slippers). I actually think this has come about as a result of the shocking back stiffness I have in the morning. It’s been a feature for years and I’ve just been letting it resolve as I get around in the morning, then exercise. Plus I’ve had a preference for totally flat shoes, without any arch support or cushioning and love walking. Now that I’m 59, this clearly isn’t going to work anymore. It’s not as sore after walking in that 1 spot on the bottom/inside of the calcaneus which was getting consistently battered for a couple of months. There can be some twinges on the sides of the heel/ankle – and the other knee! I feel like I’m tending towards the outside of the affected foot and doing some awkward moves. But once I get going, can do a reasonably normal gait. Just can’t tell if it’s getting better. Thanks for the excellent advice & info. though. I think orthotics are the best solution for reducing the pain, at least for me. Foot exercises can help a lot too, but it takes a lot more effort. I suffer from all the above however I have only been wearing FitFlops! I had no pain when I started wearing then and now I have unbearable pain and constant pain! Seriously, FitFlops are not the answer! They cause foot fatigue and in my case they are the problem!